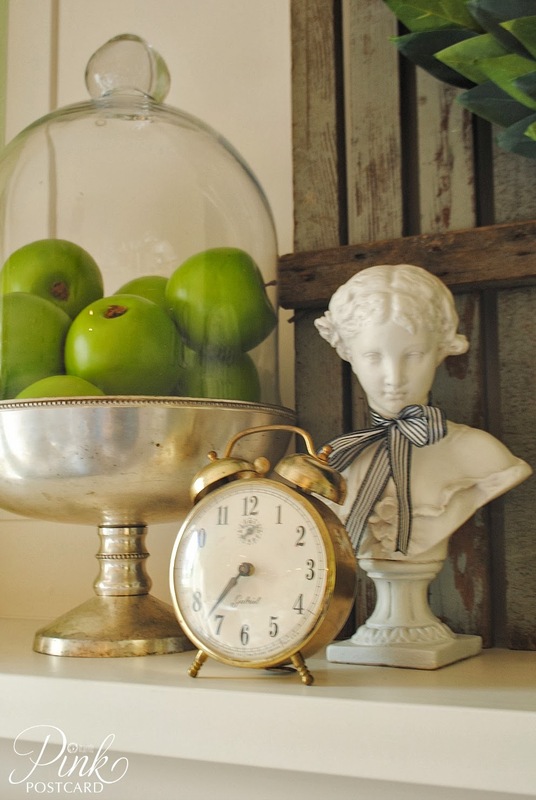 This weekend I decided to play around the house with some decor. Honestly, my mantel has still had a bit of Christmas up since just last week!! Our family room has been in a perpetual state of pause since the pretty aqua mirror I hung over the mantel came crashing down last fall. The mirror has been stuck in the corner- all through the holidays- and only just this weekend got a new home. The wood frame is so soft, I have been leery of getting the hanger restrung and back up on the mantel. 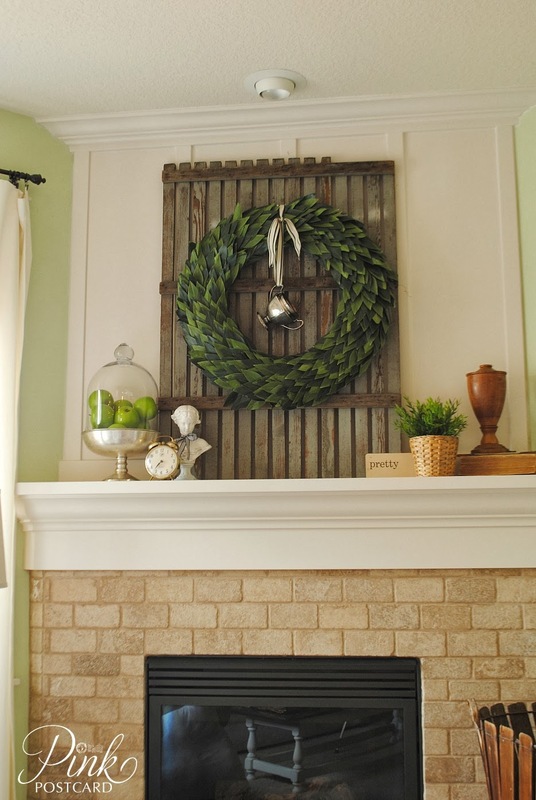 Plus, I was really digging the vintage fence that I used for our Christmas mantel, so I decided to keep that up there. I was totally inspired (and always am) by Meg's home. She has such a great eye and an amazing array of antiques. I was smitten with the way she displayed a wreath in her home, and I shamelessly copied her idea. I took one of the monogrammed silver sugar bowls from my collection, and tied it around the wreath with some black striped French ribbon. I love light, bright, girly stuff, but I also love the weight and warmth of wood and leather. I am wanting to shift a few things in our home towards a mix of those two looks. I added in a little bit of greenery with a couple elements, but kept a vintage look going with a lot of the other elements. A couple weeks ago I shared this basket on Instagram. I found it at one of my favorite places, and was determined to find the perfect spot for it at home. Wellllll…..it's been more of a challenge than I anticipated, so it's been popping up here and there. 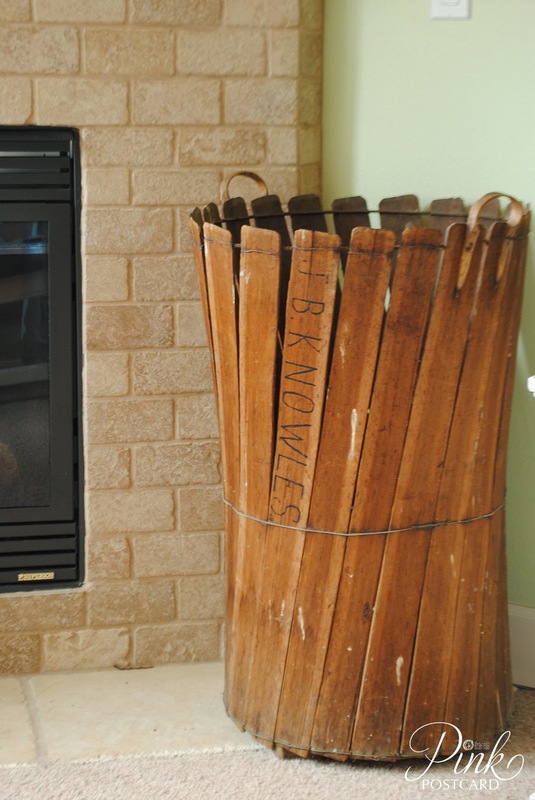 I'm not sure if it will stay put, but we're giving it a try in the family room. I may add in some big branches. I also like to believe that this was at one time Beyonce and Jay-Z's…. I'm loving our new mantel. A bit of fresh, without too much needing to be changed out as soon as the season is done. I just don't have time to do seasonal changes with everything else going on! Thanks for your visit~ I'm glad with the buckets of rain coming down today that my only plan is to restock my Etsy shop! Love your style! It's terrible about the mirror but the replacement suits. That looks great! 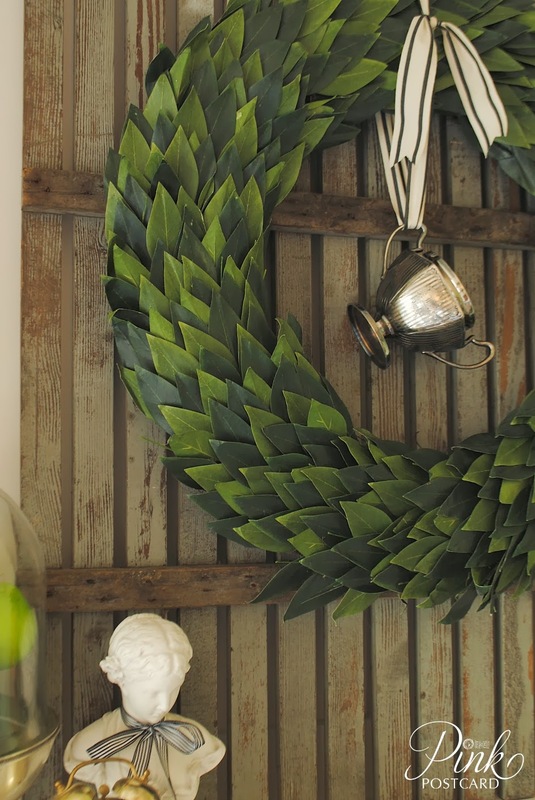 I love wreaths for spring. 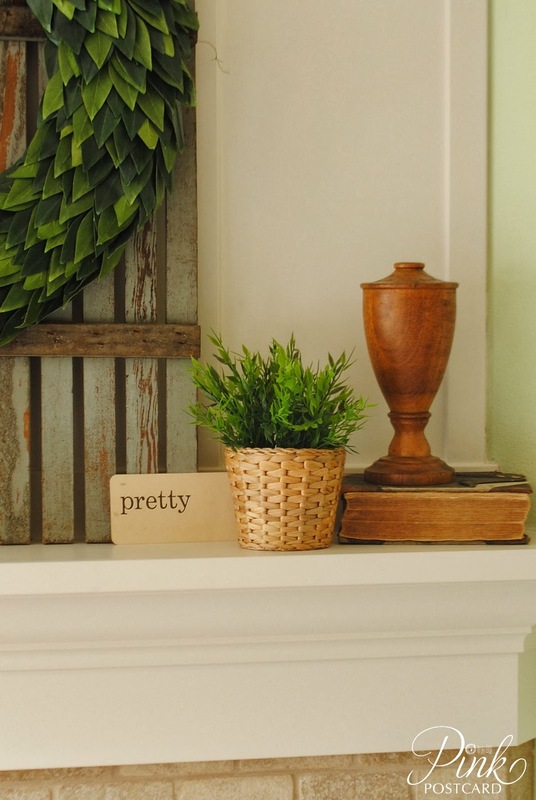 Your mantel looks great, Denise! Love the fencing there. It gives some dimension and texture to this spot. The wreath looks great hanging on it. 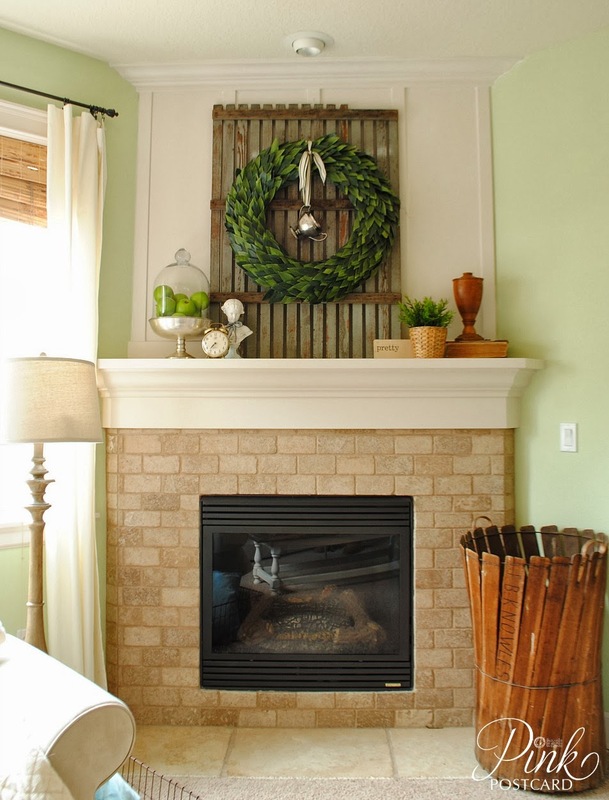 I really love that piece of fencing you found and I think it looks great with all the items you have used on the mantle. That wreath over the fireplace is gorgeous and can see why you have left it where it is and I don't think it scream Christmas. If you love it leave for now.